Clark "Bud" Hall at his beloved Brandy Station battlefield. Like this blog on Facebook | More Civil War Q&As on my blog here. Like J.E.B.Stuart's ride around the Union army in 1862, the route to my first meeting with Clark "Bud" Hall was circuitous and lengthy. In the summer of 2014, just as my wife, our two daughters and I had started a road trip from Connecticut to South Carolina for a vacation, a gentleman sent me an e-mail through my blog. "If you are ever down in Culpeper (VA)," he wrote, "I’d enjoy hosting you on a visit to Morton’s Ford. The battlefield -- both sides of the Rapidan -- is almost precisely the same as in February, 1864. Clark B. Hall." We had never met, but Hall and I certainly shared a common passion: the Civil War. I responded with a brief note and deposited his e-mail deep into my memory bank. In the process of editing Bob Zeller's book, Fighting The Second Civil War -- an excellent, unvarnished account of the battlefield preservation movement -- I kept running across the name of this Hall guy. A synopsis of him: Mississippi native ... Vietnam vet ...Marine... former FBI agent, often dealt with Mafia bad guys ... key figure in saving a slice of the Chantilly battlefield and instrumental in preserving much of the vast Brandy Station battlefield ... close friend of Brian Pohanka, the renowned Civil War battlefield preservationist who died in 2005. I seemed to recall the name of this man. Could it be? Yes, indeed, it was the same Clark Hall who had sent me the e-mail in 2014. I contacted him again, finally meeting him in person in Culpeper, Va., last spring on the middle leg of a 1,000-mile-plus road trip -- a Civil War Power Tour, I like to call it -- that also took me to Fredericksburg, Chancellorsville, the Wilderness, Cedar Mountain, Port Republic and Cross Keys. Over two days in March 2017, he gave me a tremendous tour of his beloved Brandy Station as well as Morton's Ford, Hansbrough's Ridge and points in between. A veteran battlefield preservationist, Hall recently answered my questions about Brandy Station, relic hunters, his legacy and more. Why are you so passionate about battlefield preservation? Hall: This is an especially difficult question to consider, as I don’t at all understand why others don’t feel the same way. Young Americans fought, bled and died on our Civil War battlefields, and I profoundly believe we share a collective responsibility to secure and save these sacred fields. How could we not? But when I scratch deeper at why so passionate, I go back to Oliver Wendell Holmes’ observation that those who have “shared the incommunicable experience of war yet feel the passion of life to its top.” In other words, I might have departed the jungle, but I remember every day what it is like to witness hard death in a foreign environment. And although I can’t save Vietnam battlefields where so many of my buddies fell, I can sure as hell — as emotional compensation, along with some measure of ongoing guilt-relief — work to save the ground upon which our ancestors fought and died. So, in effect, I never left Vietnam. You're especially passionate about Brandy Station, which you have fought doggedly to save from development. I've seen the look in your eyes while walking that field -- on Fleetwood Hill and elsewhere. What draws you to that place? Hall: The first time I visited Brandy Station, in 1984, I walked out onto that glorious cavalry arena and felt deep in my psyche that men, many men, fought and died here, right here, on these now-lonely plains. Way out on the ancient Cunningham Farm, in front an ancient stone wall, I kneeled down on the ground and never felt so entirely at peace in all my life. I found my home, at last, and this is right where I am supposed to be. From that day on, I have tried never to travel too far from Brandy, feeling as if something bad might happen when I’m away. I am fiercely protective of this huge battlefield — unhealthily so, some would say. The contrary viewpoints of some others notwithstanding, I am content, however, to know every square foot of the battlefield as if others might know their living room. You know the phrase, “Everybody has to be some place.” Well, my “some place” is Brandy Station. Always will be. If you could go back in time to meet one soldier at Brandy Station, who would that be and why? 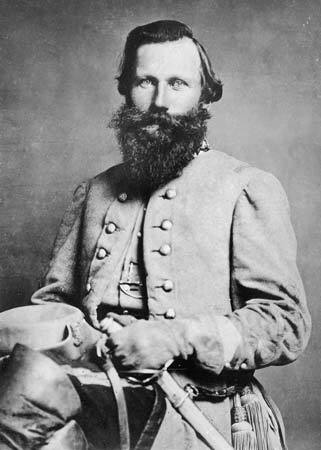 Hall: J.E.B.Stuart, my idol as a boy growing up on a hardscrabble Mississippi farm, brought me to Brandy Station and since that time I feel like that I have never left his side. He remains a personal hero, as does Robert E. Lee and John Buford. Is there a place on that field that has a more special feeling for you than any other, and why? Hall: There is a deep and remote valley on the battlefield where troopers heatedly fought each other all day long, charge and counter-charge. I quite often go down into that narrow, linear valley and just walk for hours on end. It’s the quietest, most special place on the entire battlefield. It’s all private property, but the farmer is a friend. By the way, you get absolutely nowhere in battlefield preservation if the farmers don’t like you. Being the son of a farmer, I know and admire farmers. They sense my empathy, and have never turned me away. Cedar Mountain Then & Now: 10th Maine officers examine battlefield graves. Any other Civil War battlefield that comes close to matching your feelings for Brandy Station, and why? Hall: Cedar Mountain is a special battlefield, and I never visit without feeling the deep tragedy of that beautiful battlefield. Being a Mississippian, one would not assume my heart in that savage contest rests with the 2nd Massachusetts Infantry, but I had the deep honor of marrying a Massachusetts girl, Deborah Fitts, and early on, I adopted the 2nd Mass as my favorite Union regiment. At Cedar Mountain, this fine regiment went down hard, and I never trek through the “wheatfield” there that I am not marching alongside Ned Abbott, soon to die, tragically. among the remains of a hut there in the spring of 2017. 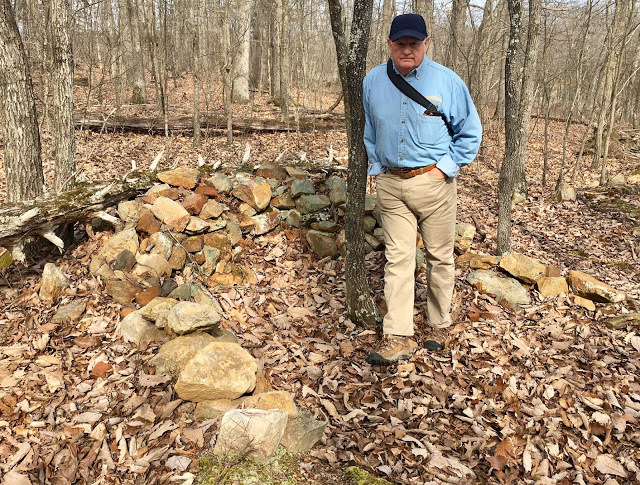 I walked Hansbrough's Ridge encampment site in Culpeper County with you last year, marveling at the well-preserved stone huts and more there. What's special about that place, and why was/is it worth saving? Hall: Hansbrough’s Ridge — and you know the place, John, as you’ve been up there — might be the most spellbinding Civil War site I’ve ever visited. Back in the mid-80s, I started going up there, and once I entered those silent woods, situated way up in the sky, it seemed to me as if I had ascended into a grand European cathedral. Greeting this solitary visitor, under heavy, protective branches, were hut sites by the hundreds, miles of deep trenches, signal platforms and and huge fire-pits. Occasional openings in the trees offered magnificent views 30 miles west to the Blue Ridge and 30 miles east to the Wilderness. It seemed to me then — and still does today — that the II Corps soldiers who departed this magnificent ridge on May 4, 1864, left their Hansbrough encampment just for the likes of us to discover well over a century later. And not only have we discovered this sacred place, but the Civil War Trust has bought it (thank God! ), and Hansbrough’s Ridge is now forevermore protected. What preservation defeat that you have been involved with nags you most and why? Hall: In the end, we have prevailed, mercifully, in every important preservation contest. Why? We are a relentless foe of any who attempt to develop our hallowed ground. The lesson: Never give up. You have strong feelings about relic hunters and battlefield preservation. Tell us about that. Hall: The bane of my very existence. In the dark of night, and in the light of day, they dig holes in our battlefields. What’s right with that? For many years, I’ve heard their diverse rationalizations for digging up hallowed ground, and absolutely none of their loopy attempts at self-exoneration hold any water whatsoever. The distinction between preservationists and relic hunters: Preservationists save battlefields for the caring public, and because it’s the right thing to do; relic hunters exploit battlefields for personal gain, which is the wrong thing to do. BRANDY STATION PANORAMA: Fleetwood Hill. Finally, how would you like to be remembered in the field of Civil War battlefield preservation? For the most part — having lost the love of my life — I live almost entirely in the past, and I’m now feeling rather satisfied that I have given the modern world the slip. So, when realizing I’ll soon be someone’s memory, I’ll continue to do my best to be a good one. So, I’ll never stop trying to save battlefields within my geographical reach. And like Sisyphus with his rock, I’ll continue to roll around Culpeper with my own tasks at hand, and never, ever stop. Who in the still houses has not heard them? The soldiers say. Our deaths are not ours; they are yours. They will mean what you make them mean. They say: Whether our lives and our deaths were for peace and a new hope or for nothing, we cannot say. It is you who must say this. They say: We leave you our deaths. Give them their meaning. We were young, we have died, remember us. By the way, one person can make a difference. -- More Civil War Q&As on my blog here. 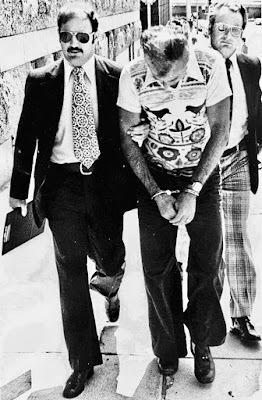 Bud Hall is a good friend of mine and I feel grateful to have found this blog site. Bud is a great person and a great preservationist. I have had a personal tour of Brandy Station and Culpepper County with Bud and could feel his compassion. Great interview John. We're very lucky to have people like you and Bud who care enough about this stuff to keep our history alive. I just read Bob Zeller's book a few weeks ago and it was outstanding. I took away just how much time and effort has gone into saving these hallowed fields. And out of all of the individuals that the book exemplifies Mr Hall is the man I would most want to meet, shake his hand, and say thank you for all he has done. I was just at the Brandy Station Battlefield for the first time this past May and was overwhelmed. I walked Fleetwood Hill, and the preserved land out by the airport. I would love to go over the ground with him, to see the passion he displays, and to take in some of his vast knowledge of the field. Love the interview, maybe someday he’ll require help with what he does. Dream job and why i keep going to school. how can i get in touch with Bud Hall? i have some information on some sites for him.